I previously learned about this book, when Messer Daly was a guest on the Autosport Radio Show way back in January. (Jan. 29 if you want to listen to the archive) and he was there to talk about his track designing, book and son’s racing career. Derek DalyWhat do you say about this man? A true racer at heart. Having driven in Formula 1 and IndyCars during his racing career, he has not strayed from racing since. From his television work to a driving school Derek has always supported motorsports. He now has added another chapter to business world... that of track designer. Derek worked Prairie Hills Motor Club to design a facility that can accommodate most any division of sports cars for most any type racing they wish to do. 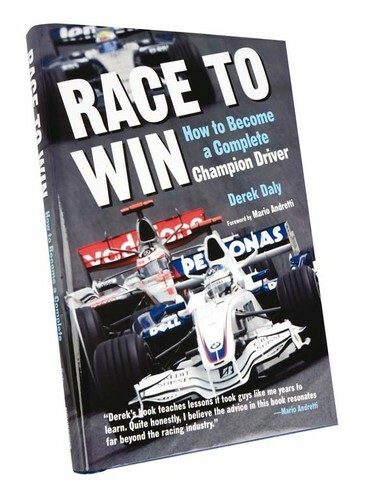 Derek has also authored the newly released book "Race To Win".On top of all this, his son Conor is rapidly making a name for himself in the world of motorsports. Look for another Daly to come along soon to a race track near you.